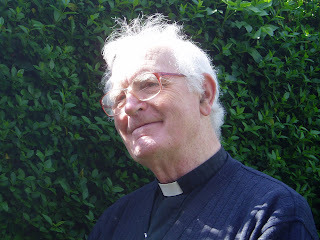 Ponteland parish has lost a wonderful priest and a lovely friend with the death last week of Father Vincent Melia. Aged 81 years he was looked after latterly by the Little Sisters of the Poor, also known as St Joseph’s, at their home on Westmoreland Road in Newcastle. His brother Michael is presently a resident with them. Father Melia came to St Matthew’s Roman Catholic Church in Ponteland in 1976 after the death of Father Leo Doyle and he was able to use money left by Father Doyle to extend the church to its present size. He was in charge of the parish but was never parochial and he was a motivated to pursue ecumenical projects cooperating with the other churches in Ponteland, St Mary’s, the Methodists and the United Reform Church. The churches combined for some events at Christian festivals such as Christmas carol services and the Raising of the Cross at Easter, and in village events such as the Party in the Park. People of all kinds, old and young, rich and poor, Catholic, Protestant or of no faith, counted for Father Melia and he was generous both with his time and his hospitality. He was friends with everyone. Born in 1930 in Gateshead, Father Melia and his older brother Michael both eventually attended the Roman Catholic Ushaw College in Durham to train for the ministry. Ordained in 1956 Father Melia had a number of postings south of the river Tyne before he came to Ponteland. He was very well known and was a familiar figure on his scooter as he travelled to all parts of the parish and into Newcastle. He helped people in the West End of Newcastle, often taking furniture or unwanted domestic machines for refugees or to those in hard times. Once, when he was doing a good deed in Benwell, his scooter was nicked and stripped of its parts and he was unable to get about so easily. However, a local business man heard of his plight and donated a spanking new Suzuki for the peripatetic priest to allow him to answer his calls and see his parishioners and friends. Vincent Melia had a fine musical talent and a tenor voice, great assets for a priest leading his congregation. He also played the guitar and encouraged the choir at St Matthew’s which is still going well. He looked after the children’s needs with annual trips to Sunderland for ice skating and to the Panto at Christmas, and the pensioners had a luncheon club and an annual outing. A number of trips were made to Lourdes with his parishioners and he made a once in a lifetime trip to India with a small group from his congregation, some of Indian origin. This was a gift to him from a grateful church who donated the necessary funds. Father Melia was presented in 2007 with an engraved bowl by the then parish chairman, Frank Harrington, to mark thirty years of distinguished service to people of all faiths in Ponteland. Asked if he was considering retiring he said, ‘I could retire but where would I go? I love the people here. They are my friends.’ In fact the Bishop had proposed to move him on but this was fiercely resisted by his flock and he was able to stay in Ponteland. Father Melia enjoyed his visits to the Club, or CIU, on Merton Way and enjoyed a pint and a chat with the regulars. After Father Melia’s funeral on Monday last everyone, and there was a big crowd, was invited to the Club for refreshments. He planned this party before his death and made the necessary arrangements. We shall all miss him. He is irreplaceable. The priest who has been taking the services recently is Father Seamus O’Kane who is based at St Mark’s in Westerhope and he will now be in charge of Ponteland as well.